Swinging consistently well requires focus. To play golf well -- up to your capability -- requires learning how to focus your mind on executing each shot. Golf requires total concentration but just for brief periods of time. Between each shot a golfer is able to socialize with his playing companions or enjoy the beautiful scenery along the course. A golfer can learn how to improve his focus just as he can learn how to improve his swing. Begin focusing by practicing before each round. 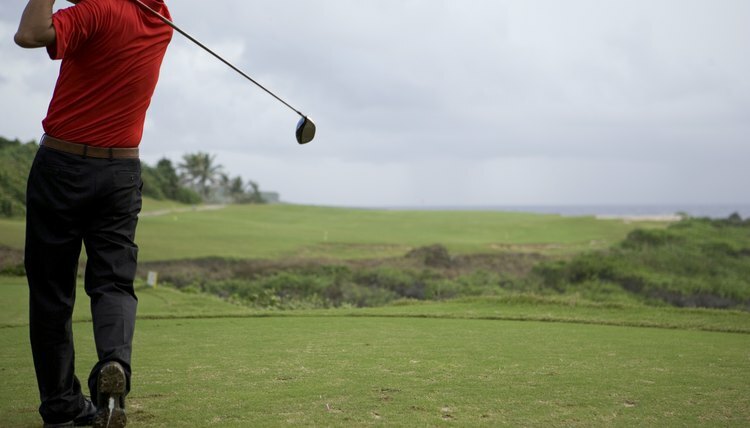 Hitting warm-up shots on the driving range helps you get your muscles loose before you play, but use this time to tune out distractions and focus your thoughts on playing golf. Two-time U.S. Open champion Curtis Strange goes through a regular warm-up routine of hitting 40 to 50 practice shots with the same selection of clubs. He starts with a pitching wedge, and then moves to the 7-iron, 5-iron, 3-iron, 4-wood, 3-wood and driver. He believes this routine gives him the feeling that he has already begun his round -- before he tees off. Develop key swing thoughts. These are aspects of your swing that you want to concentrate on, such as making sure your takeaway is slow and smooth. In his classic instruction book "Golf My Way," Jack Nicklaus warns against trying to think of too many things at once prior to swinging. He believes two swing thoughts is about the limit for most golfers. Forget about previous bad shots and focus on the next shot. Dwelling on a missed short putt, for example, only serves to draw your focus away from properly planning and executing the next shot with precision. Many amateur golfers let anger get the best of them and swing too hard or too fast on the next shot -- with predictably poor results. Don't rush your swing because you are not confident about playing a particularly difficult shot. You might have a hole that has been your nemesis in the past and just standing on the tee makes you anxious. Jack Nicklaus in his book "My Golden Lessons" advises that you slow everything down and take a deep breath, then intently focus on the technical factors of playing the shot -- wind, distance, how you want the ball to curve. This extra degree of concentration can help prevent tension from affecting your swing.